While the stars of Eurovision 2016 have been parading on the red carpet as the opening ceremony, the contestants from the Big 5 have had one more thing to do – finding out which half of the grand final they’ll be performing in. Each of the artists drew to determine whether they’d be performing in the first or second half of the grand final on Saturday. They’ll be joining host country Sweden who previously drew ninth place. Generally it’s considered that performing in the second half is more favourable, but the winners from the previous two years comfortably earned a victory from a first-half performance, Conchita from the 11th slot, Måns from 10th. The semi-finalists will draw their halves at the press conference following each semi-final. The final running order will be determined by the producers of the show, with the EBU having final veto. The running order will be announced on the evening of May 12, after all the finalists have been decided. We’re on the red carpet, covering all the action as the stars make their way to the opening ceremony of Eurovision 2016. Follow all the action on Twitter and Instagram. Poll: Who had the best rehearsal on May 8 at Eurovision 2016? I think being in 1st or 2nd half matters because people tends to forget first performances or get tired by the end. But what matters the most is getting placed between songs that don’t overshadow your musical qualities or strong points. I mean, If you put Poland between Belgium and Bulgaria, Michal will shine. But if you put him between Australia and the Czech Republic, these three are slow ballads in a row that could make a negative impact in any of them. Flashback to 2013: France had an awesome song. France was put 2nd in performance order. Everyone forgot France… Hopefully, that won’t happen this year! IMO running order is not about the winner. A winning and arguably top 5 (maybe even top 10) can reach those placings no matter where they are drawn in the final. Where it’s important is for those songs placing 11th-20th for which I think the running order is v important. For a lot of countries it is about doing respectably (hi UK) and there is a huge difference coming home with 15th place compared to finishing 20th. Looking at the running orders of the past few years, there seems to be a constant in determening the running order. No need for so much paranoia allready. The countries that won their semi, are always at the end of their half (first or second). Amir’s song is great to put before or after a commercial break, I think… so that would be 10th more or less? Last year it was the same: favourites in first half: Sweden (10), Australia (12), Belgium (13); in second half: Russia (25) and Italy (last). if it is Australia that has to win so Russia wouldn´t, then I would even prefer Belarus. Australia is booooooring. nothing special. not enough spark. Just vote for Estonia, will you? We are inbetween the Nordic clicque and Russia. our song is the coolest and classiest! I’m French and there is one thing that I need to add. If SVT gives one more time a debut order for France, I’m 100% sure that France will withdraw if the contest next year. FranceTV’s team considers that is not normal that one country have, in 3 years, a debut order in the contest and want to withdraw if still the case this year. And I agree. So SVT, don’t do a bad thing. 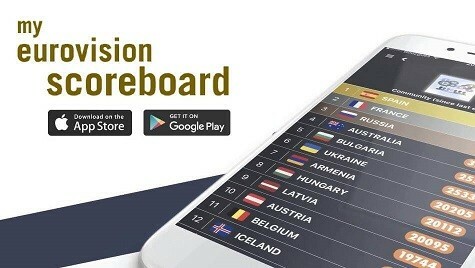 If you put France to open the Contest, you can say “bye” to France for, at least, next year! Italy will most-likely perform somewhere between 1-5. Germany will most-likely perform somewhere between 6-10. France will most-likely perform at the very end of the first half. France is one of the favourites to win the contest, so I doubt SVT will ruin their chances by making them open the show. But, then again, most Swedes lack any common sense. So, in that case, France is in limbo to screwed. If they are not dancers, what are you doing Barei bringing them on stage? why not to bring real dancers? maybe from the video as they are so cool and funny sometimes. I don’t get it. You have a good song and this could be such a hit on stage. Why you want to show the world a group of uncoordinated, out of tone, and boring backing vocals? why? put them on the side, hide them or don’t bring them at all!! You wili lost money on betting on Spain. Maybe to betting worst BIG 5 , Spain have best chance for that. France is gonna get stuck in the #2 position is going to want to keep him as far away from Frans as possible, but it’s not a “show opener” type of song, so 2nd is the only place they can put him. Winning song, amazing performer, and right draw. If they solve the light and choreography issue, I would start betting for Spain ???? Loo I saw it but it dissappeared.Did you see my name? I think since the final has become so long – with 26 songs – the ideal positions are 10-19. I feel the UK didn’t do as well as expected in 2014 because of singing last and the people are tired or bored by that time. But then last year Il Volo won the telovote so you can’t exactly say. Good luce Barei!You can win tú e Eurovision Song Contest 2016!!???????? I hope Russia or Ukraine gonna be nr 2 in the final. Then its not gonna Winn. Its the 2 worst Song this year. Loo the first artivle in wiwibloggss facebook is this article with the allocation draw. What do you mean Bella? The first article on wiwibloggs? I predict SVT will ruin France but no way it’ll be #2 spot since France sang #2 last year. It won’t open either cause I don’t think it’s as flashy to open. Neither will Germany open cause the staging isn’t much. Italy might open. We all know that even if Russia draws the first half, Sweden will give him the last slot available, unfair but will def happen!!. In 2015, 5 of top 7 from public voting performed in the first half: Israel, Estonia, Australia, Belgium and Sweden. Russia, will pay a fortune for a good position.